I developed the P.E.A.C.E. principles of organization as a response to the most common concerns expressed by my organization clients. The above image illustrates the concept nicely. Here we have a neatly balanced stack of rocks. The rocks are not perfectly fitted to one another. Their edges are smooth but they are not flat. Balancing still presents a challenge and requires effort and care. Nearby waves are crashing, posing a potential threat to the stability of the rocks, but the rocks are removed a safe distance so as to be aware of but not directly impacted by this outside influence. All around the balanced pile are other rocks which might have made it into the stack but did not. This suggests to me that the rocks which were chosen were carefully selected. This simple scene is reminiscent of how we achieve balance in our own lives. We have to remove ourselves a safe distance from potential threats to our well-being. We have to choose what is important and what is not and feel comfortable with the choices we make. At first glance, the five principles discussed here may not appear to have much to do with organization. In truth, they apply broadly to the full spectrum of organizational issues. What's more, when consistently applied, they have the power to transform lives by reducing stress, increasing productivity, improving peace of mind, and fostering a sense of empowerment. The first of our P.E.A.C.E. principles of organization (so named for the peace of mind that comes from implementing them) is prioritization. Author Jon Acuff said, "You don't just give time to something, you take it from something else. To be good at one thing, you have to be bad at something else." In other words, you have to choose where to spend your time and what to neglect. This principle applies to stuff as well as to time. We might likewise say, "You don't just give [space] to something, you take it from something else." It's important to decide what really deserves a space in your home and life and to let go of those things you don't want, need, or use. Nineteenth century English textile designer William Morris offered this guideline for determining what things have value in your life: "Have nothing in your house that you do not know to be useful or believe to be beautiful." The question then for each of us is: What story is my stuff telling about me? This is where prioritizing comes in. By determining what really matters in our lives, both in terms of how we spend our time and what we choose to surround ourselves with, we become mindful curators of our own life's museum; we decide what story we want to tell. Making Excuses -- "I don't have time to get organized." "I don't have enough space for all of my stuff." "I don't know where to begin." "I don't have what I need to get started." Sound familiar? Indecisiveness -- This is a big enabling factor when it comes to overcoming clutter and getting organized. It often takes one of two forms. We are sometimes indecisive about what to do with things. Should I get rid of it or shouldn’t I? or Where should I put this? We are also indecisive about what comes into our homes. Instead of making decisions we end up with a lot of things we don't want or need. Negative Self-talk -- Negative self-talk has a tremendously limiting effect on our behavior. 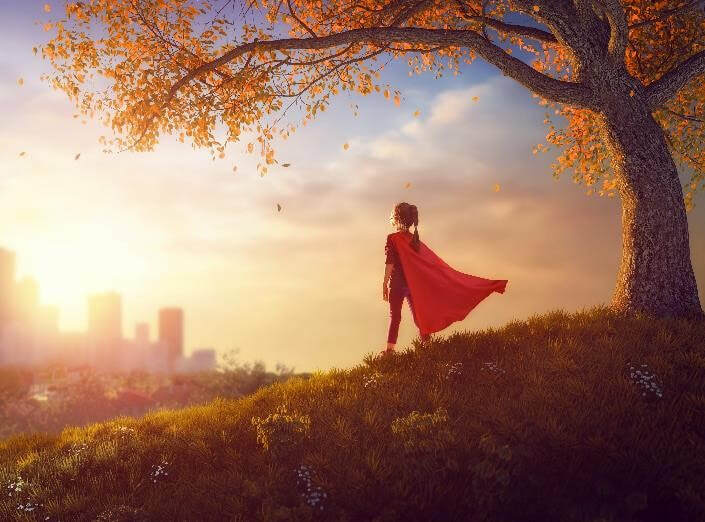 When we let ourselves think, “I’m just not an organized person” or “I’ll never be able to do this” we prevent ourselves from progressing toward our goal. Take Action -- Instead of making excuses, take charge of the situation. Identify where the problems are and what’s contributing to them. Then use that information to set realistic, attainable goals. Pace Yourself -- Don’t try to do it all at once. Understand that this is a process. Then, instead of procrastinating, pace yourself. Take it step by step. Believe in Your Ability to Succeed -- Maybe you’re not the most organized person in the world. It doesn’t matter! Organization is a skill, and it can be learned. The key is finding someone to teach you (That's where I come in). Be Decisive -- Decide to limit what comes into your home. Decide what’s important and what isn’t. Use those decisions to empower your actions. This leads us to the next of our principles of organization: action. Ever wonder what it is that causes us to procrastinate? Researchers have taken a look at what’s going on in the brain and have come up with a theory to explain our tendency to avoid doing the things we know have the potential to improve our lives and make us happier - like exercising, eating healthy, saving for the future, and...yes, getting organized. Author James Clear explains this process in his article Procrastination: A Scientific Guide on How to Stop Procrastinating. This means we have to find a way to make the rewards of doing whatever it is we are avoiding immediate. Turns out, that isn't as hard as it seems. The key is action. The hardest part of doing most things is getting started. Once you start, the reward becomes inherent in the activity as you begin to reap the benefits. Motivation often comes after starting, not before. Success breeds success. The more we act, the more we experience the benefits of taking action, and the more we want to keep going. This is definitely true when it comes to organization. Clients often call, text, or email me after a session to tell me about the additional work they did on their own. They had such a good experience with getting organized that they can't wait to organize something else! Aristotle is reported to have said: We are what we repeatedly do. Excellence then, is not an act, but a habit. If that is true, and I believe it is, then consistency is important to success in any pursuit. That is certainly the case when it comes to organization. 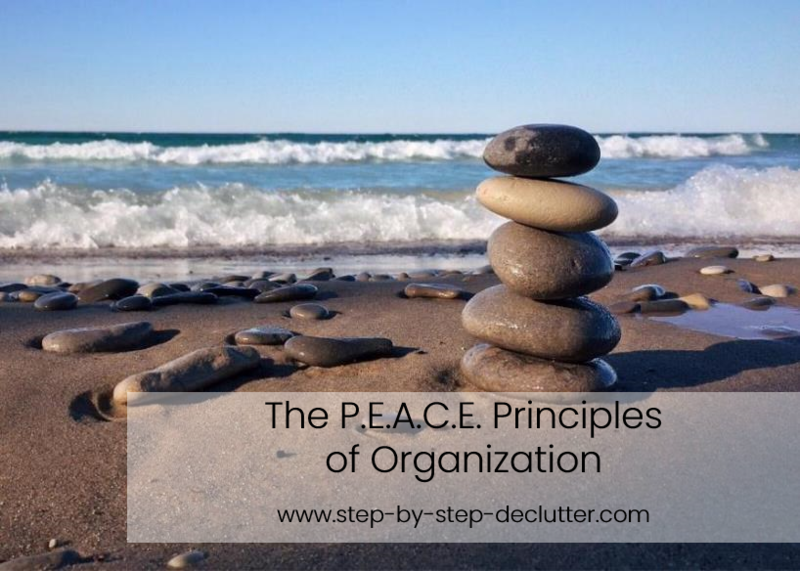 Understanding and implementing basic principles of organization is an important part of the process of getting and staying organized. Establishing systems is another great way to consistently maintain an organized life and home. Systems are methods for doing things that are specifically designed to resolve a problem. Click on the images below to read more about principles of organization and developing and maintaining systems for organization. Evaluation is the final P.E.A.C.E. principle. It plays an important part in the ongoing struggle to maintain an organized home. Life and clutter are constant. Both can be relentless at times. A once orderly space can quickly become a chaotic mess in the wake of a busy lifestyle. For this reason, it is important to periodically take stock of your situation. What's working? What isn't? If one of your systems has ceased working, why is that? Prioritizing your time and your stuff, empowering yourself to succeed, acting with consistency, and continually evaluating your progress - these principles are the foundation of an organized life and home. If you can successfully do these things, you will find getting and staying organized much easier. If you found this page helpful, please share it on social media. Then leave me a comment in the section below so I can thank you personally.